Sierra Nevada sightseers; image by Tom Adkinson. 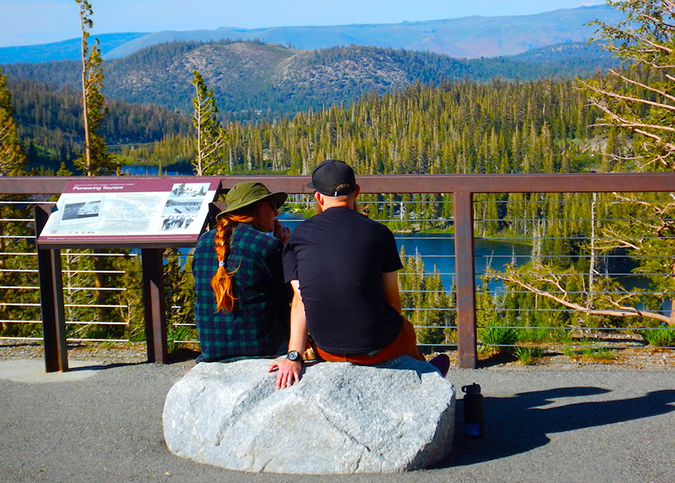 MAMMOTH LAKES, Calif. – Two sightseers in the Sierra Nevada take in the view of one of the several alpine lakes that give this area of mountainous central California its name. (The other half of the name comes from a gold rush mining company, not real-life mammoths.) The lakes are high-elevation stunners, sparkling tiny jewels that on calm days produce mirror images of gigantic mountains that reach to the sky. The highest is White Mountain Peak, which at 14,252 feet is California’s third highest mountain. The lakes are famous for rainbow, brown and Alpers trout. Alpers trout are a pedigreed trophy fish that are named for the family that produces them on the nearby Owens River. They are developed for size, fight, appearance and taste and can grow to 12 pounds or more. The average is 2-4 pounds. They are one reason people eagerly await “Fishmas,” the opening day of trout season every year, usually the last Saturday in April. 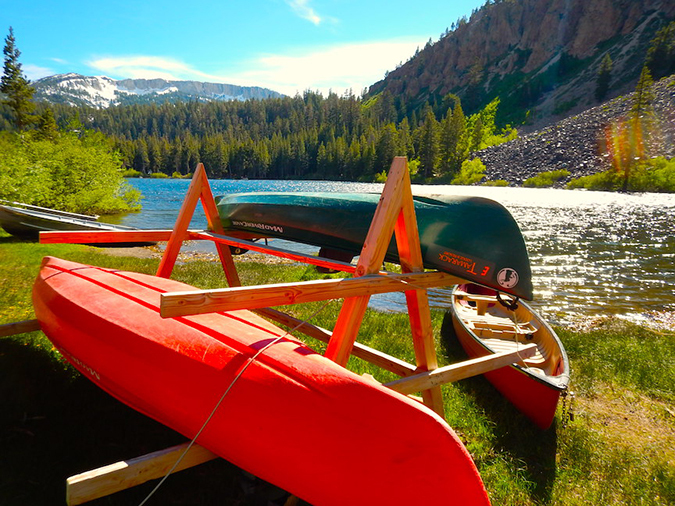 The region – due south of Yosemite National Park and about three hours from Reno, Nev., and five hours from Los Angeles – is a four-season recreation area, often with overlaps between skiing, hiking, fishing, birding and nature photography. Ski season can last into July, long after hikers and fishermen are on the scene. Canoes at the ready; image by Tom Adkinson.